Northern Lights Video Slot Guide & Review - Casino Answers! 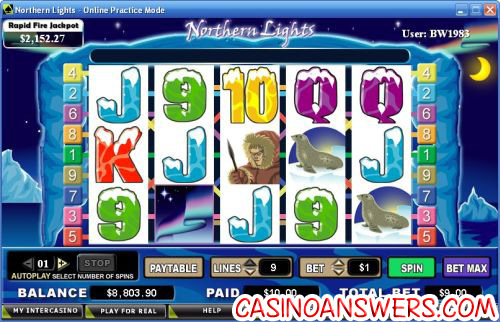 Northern Lights is a 5-reel, 9-line video slot found at Cryptologic and Vegas Tech online casinos. For the purposes of this review, we will be looking at the version found at Cryptologic casinos. 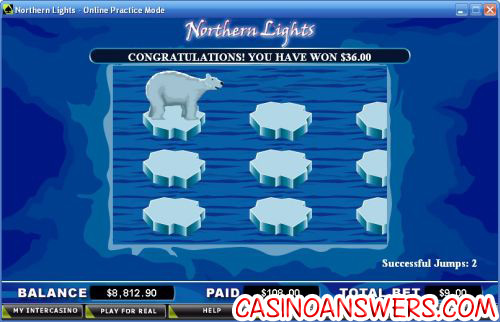 Northern Lights features a wild substitute symbol, scatter wins, a bonus game and a progressive jackpot. You can play the Northern Lights video slot at Cryptologic casinos including Casino Joy or at US-friendly Vegas Tech casinos such as Online Vegas Casino. Bets per line on the Northern Lights slot machine are $0.05, $0.10, $0.25, $1, $2 and $5. Due to the difference between the quarter line bet and the dollar line bet, there is a bit of a gap in the betting range that players should be aware of. The lowest total bet you can make on the Northern Lights slot game is a nickel per spin, whereas the highest possible bet is $45 per spin. Northern Lights is a great video slot for casual and low stakes players. To play Northern Lights, hit “Spin” or for all 9 paylines, use the “Bet Max” button. The highest paying symbol in Northern Lights is the Polar Bear symbol. To win the top fixed jackpot of 6000 coins, you must hit 5 Polar Bears on an active payline. Other high paying symbols include the Eskimo (3000 coins) and the Whale (1000 coins). The Polar Bear symbol is Northern Lights’ wild symbol, so it substitutes for all symbols except for the Scattered Aurora symbol. The Northern Lights video slot is linked to a Rapid Fire Jackpot, which at this time is at $2,175. The Rapid Fire Progressive Jackpot pays out randomly on any possible spin you make. The larger your wager in on a spin in Northern Lights, the more chances you have of winning the progressive jackpot. You cannot trigger the progressive jackpot during a feature. Try and win the Rapid Fire Jackpot now by playing Northern Lights at Casino Joy! When 3 or more Aurora symbols appear anywhere on the reels of Northern Lights, you will trigger the Northern Lights bonus game. In the game, you must select which iceberg you want the Polar Bear to jump onto. For each successful jump, you will win a prize. The game will continue until the Polar Bear falls into the water. You can win up to 2000X your triggering bet on each jump in the bonus game! Bonus game wins are added to payline and scatter wins. Only the highest win on each selected payline is paid out. Coinciding wins on different paylines are added. Payouts are made according to the Paytable. Payline wins are multiplied by the bet per line. All symbols pay left to right only in consecutive order, except for the Scattered Aurora symbols (which pays any). Scatter wins are multiplied by the total bet. Scatter wins are added to payline wins. Scatter wins are paid independent of lines selected. To use the autoplay mode on Northern Lights, simply use the “+” and “-” symbols above “Autoplay” to select your number of desired autoplay spins, followed by the “Spin” or “Bet Max” buttons. Stop autoplay by hitting the “Stop” button that is located next to the number of spins. The Northern Lights slot game has most of what the average slots player expects to find in a video slot. It has a wild symbol, a scatter symbol, a bonus game and a progressive jackpot. The only thing really missing is a free spins feature. It is a bit dated now compared to other video slots and may not have anything that makes it stand out, but it is still a very solid video slot. To play Northern Lights, sign up and make your first deposit today at Casino Joy or Online Vegas Casino! How do I win the Northern Lights progressive jackpot? To win the Northern Lights progressive jackpot, all you have to do is spin to win! To better your chances of winning the progressive jackpot, try increasing your bet. Are players from the USA able to play Northern Lights for real money? Absolutely! Players from the United States are welcome to sign up at Vegas Tech casinos including Online Vegas Casino. If you are a player from outside the United States of America, you will probably be better off playing Northern Lights at a Cryptologic casino such as Casino Joy. Where can an American play the Northern Lights Video Slot?